The recently unearthed rot in Indian politics, where a corporate lobbyist was heard on the tapes trying to fix cabinet berths, poses questions on how political parties raise funds. One big reason for politicians to be gullible to corporate pressures, apart from greed, is the amount of money that is needed to contest elections. The fundraising by political parties has been downright unprofessional and lacks transparency. In fact bollywood flicks like Omkara and Ishqiya has goons proudly calling their extortion work as ‘fundraising’. Is this really fundraising? If the Indian political parties want to learn they have President Obama as a role model. President Obama's victory in the general election was aided by his tremendous fundraising success. Since the start of 2007, his campaign relied on bigger donors and smaller donors nearly equally, pulling in successive donations mostly over the Internet. After becoming his party's nominee, Obama declined public financing and the spending limits that came with it, making him the first major-party candidate since the system was created to reject taxpayers' money for the general election. The level of success he achieved using techniques of fundraising- mailers, new media, direct response television was unprecedented. The campaign relied a lot on small individual donors, who poured their hearts and wallets out. This technically reduces the dependence on big donors who may later arm twist. Political parties in countries like UK , USA , Australia are already banking on individual donations . As per figures from Federal Election Commission contributions to federal candidates and political committees by individuals have increased during the past 10 years, and collectively, they are consistently larger during presidential election years. In the 2008 election cycle, the lawyer community alone contributed a massive $234 million to federal political candidates and interests. Close to home are the Indian NGOs to take leaf from. In India where fundraising itself is at a nascent stage, fundraising from individuals is limited primarily to NGOs. 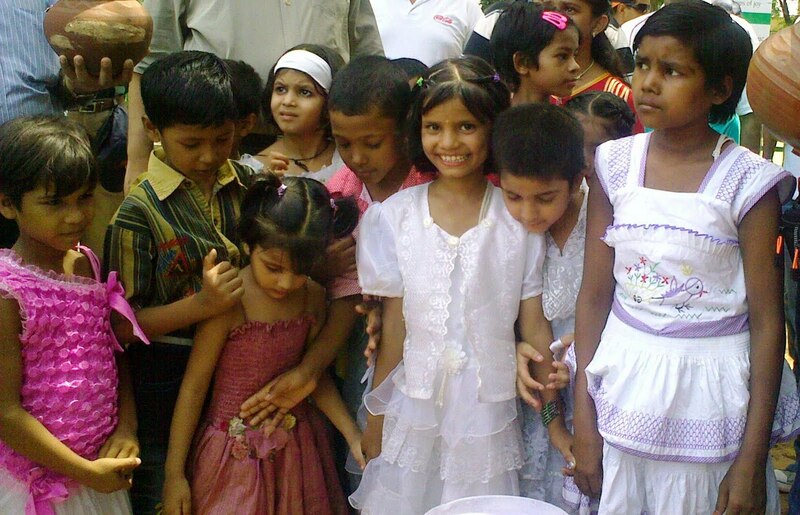 Slowly but steadily the number of NGOs that raise funds professionally has seen an increase. Till few years back you could count them on your fingers. Today the list is much longer and includes not only the international NGOs but also homegrown small and medium sized NGOs. Since they raise money from small individual donors their dependence on larger funding agencies decreases. This in turn makes them freer to run their programmes. Few universities have also now realized the importance of individual funds and have started approaching their alumni for funds. Recently, the University of Mumbai got its biggest donation of INR 320 million from an old student of Poddar College. It is high time Indian political parties and political candidates start doing the same. Introduction of professional fundraising would make politicians freer from arm twisting major financers. In fact the answer lies in having a more focused approach towards donations from individuals. After all retail is the key word everywhere, be it a FMCG product, a restaurant chain, a shopping complex or a clothing brand. World over individuals are the biggest contributors to social fundraising .They are the most bankable in terms of continuity and loyalty even in the most difficult of times. Even the great economic turmoil did not deter individual contributions in the US or other parts of the world. Is any Indian political party or candidate willing to take this route? Time will only tell. Every time you click and beat a drum, Esprit would contribute money to give a loving home to a child in need. See the video below on its association with SOS Children's Villages and how your beating the drum helps. 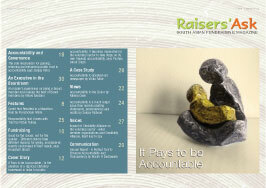 The new edition of Raisers' Ask the fundraising on-line magazine for South Asia takes a look at fundraising for emergencies. Emergency fundraising is highly relevant to our sub-continent given the number of man-made and natural disasters we face. And as the case is, NGOs jump in willingly to provide aid. But NGOs need money to do be a good samaritan. How do they get it. This issue talks in depth about it. Click below to read on. 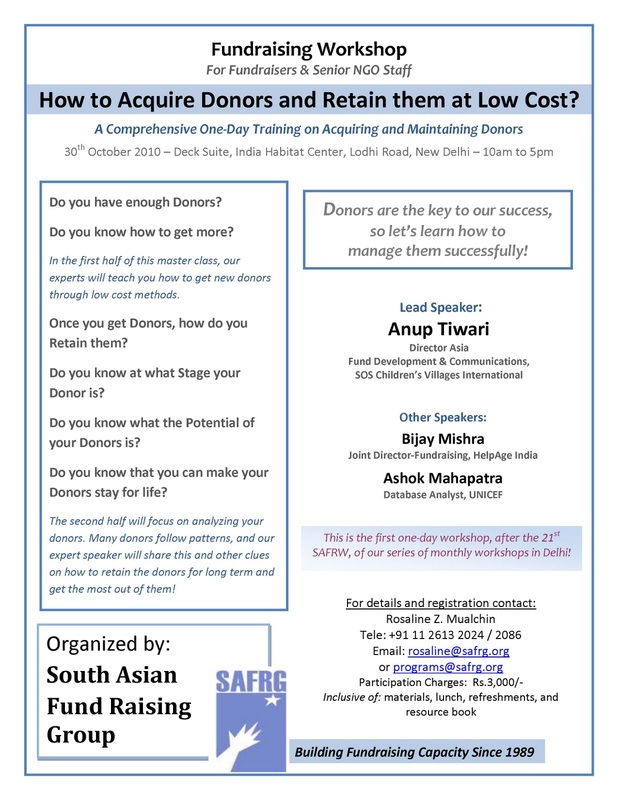 Ashok Mahapatra from UNICEF gave in a very interesting session during SAFRG's workshop on "Low Cost Donor Acquisiton and Retention" where we were co-speaking. Lots for everybody to learn from. The presentation is as below. View more presentations from Ashok Mahapatra. 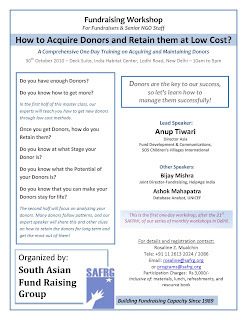 Dear 30 odd participants at SAFRG's Master Class on "Low Cost Acquisition and Retention of Donors". Thank you for your enthusiastic participation. Please find below the presentation as promised. SOS India requires a senior fundraising professional to head its fundraising operations in India. The job description for the position is as below. Please refer the suitable people in your network to apply for the same. MBA with specialization in Marketing or post graduation in Marketing from a reputed institute with 10-15 years experience in Fund Raising. Ideally already heading FR function of a leading NGO with local fundraising to the tune of several crore rupees annually and a donor base of several thousand; experience in both individual and institutional fundraising as well as new media and experience in both in-house and outsourced fundraising. Candidates having experience in sales/marketing will also be considered. 3) Periodically monitor target achievement against objectives and budgets, take appropriate corrective actions. 4) Ability to manage branch offices located through out the country. 5) Ability to handle media and PR Functions. 6) Oversee and ensure end to end servicing of the national and international donors and sponsors. 7) Anchor marketing understanding in the organization by creating a positive mindset in the field for the support of FR activities and building brand SOS. 8) Coach and monitor performance of subordinates and coordinate with HR for opportunities for development and growth to ensure increased fund raising from India. 9) Must possess excellent presentation skills. Excellent communication skills. Exposure to 1-2 regional languages would be an advantage. High proficiency in English language is required. This is a Senior Management position at the level of Deputy National Director reporting to National Director (CEO). As per norms of the organization. Candidates meeting the above requirements may send in their CVs to recruitment@soscvindia.org, along with a covering letter mentioning their suitability for the position. Only shortlisted candidates will be contacted for further process. Indian companies, family foundations and individuals are waking up to social giving. Have you? With the globalization of Indian economy businesses have been growing at a rapid pace. India Inc. is fast finding its place under the sun. As these changes sweep in, also creeping in is the concept of planned and strategic social giving. This is also very commonly mentioned as Corporate Social Responsibility or CSR for short. Although CSR encompasses a wider phenomenon of being responsible in all that the company does, but social giving continues to be the most visible face of CSR. The last decade has seen a rise in CSR activities. We now have this set of new corporate leaders who believe in the mantra that power of money lies in giving away. Corporate like Infosys and Wipro, have shown tremendous interest in investing their wealth for social development. They have demonstrated how several strategic approaches used by professional organizations can be applied for formulating policies and programmes for inclusive growth. They want to give it back to the society from which they have grown. Four Indian corporate leaders featured in Forbes’ list of Asia Pacific’s most generous business personalities this year are women, including biotech major Biocon’s CEO Kiran Mazumdar-Shaw and Anu Aga of Thermax. The two others making it to the business magazine’s ‘48 Heroes of Philanthropy’ list are Kiran Nadar, collector of contemporary Indian arts and wife of HCL Technologies co-founder Shiv Nadar, and Rohini Nilekani — wife of IT major Infosys’ co-founder Nandan Nilekani. Ms. Nilekani, who supports many NGO activities, has featured in the list for the second consecutive year. India this year also became the first BRIC country to be ranked a major donor by Save the Children, reflecting widening philanthropy in the world’s fastest growing economy after China. It is now on par with donors like Italy, Germany, Romania, and South Korea. It has moved from an economy where people concentrated on donating to local religious bodies, community centers, schools etc. In many ways, India leads the way in emerging-nation philanthropy. Its pool of millionaires (technically, those with investable assets over $1 million) has grown an average 11 percent a year since 2000, one of the fastest such rates in the world, says a recent report from Bain & Co., a global consulting firm. Despite the global recession, as per Forbes March report the number of billionaires grew from 27 in 2009 to 52 this year. India's charitable giving rose to 0.6 percent of gross domestic product by 2006, topping Brazil's 0.3 percent and China's 0.1 percent, according to Bain. India still lags behind the United States (2.2 percent) and the United Kingdom (1.3 percent). Part of the difference is the legal incentives offered to donors in the US. A hefty inheritance tax – up to 46 percent on estates over $2 million – encourages individuals to form foundations and give more to the society. This change in the mindset can be attributed to number of factors but majorly to the gap between rich and poor which is making life untenable or, at least disagreeable, for rich and poor alike. Unlike West where people don’t leave much behind for children and family, In India people still believe in leaving behind their legacies to generations to come. But now we have a breed with changing mindset. We have our own Warren Buffets who want to give their children enough to attain their dreams but not so much that they do not do anything. Corporate Social Responsibility (CSR) is the most prevalent form of philanthropy worldwide, though the levels of activity and organizational involvement vary widely. Most large organizations have a social responsibility arm, with budgeted resources and dedicated staff, which works towards improving the quality of life of the workforce and their families, as well as for the local community at large. Most philanthropic initiatives are undertaken in the business neighborhood, mainly because of the immediate impact on local stakeholders. Corporate social responsibility has much broader implications for the nation as a whole. It reduces dependency on the government for social change. 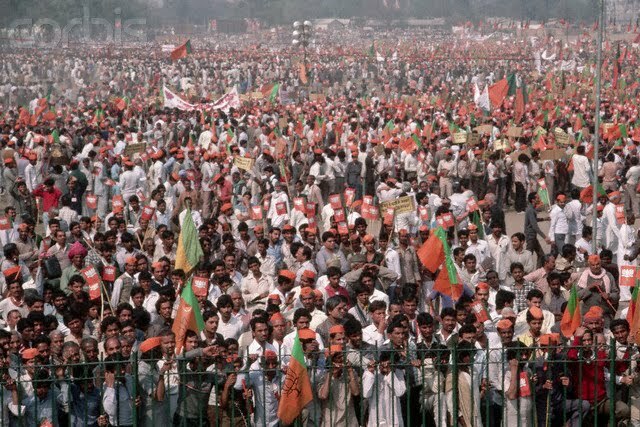 Most governmental programmes quickly become embroiled in political manipulation, corruption, communal overtones, and bitter infighting. There is a need for public-private partnership with well-defined controls and processes for the best use of resources for social change. Social reforms driven by the community will bring people together, turn the attention of the masses to tasks that benefit society, and reinforce peace and harmony. CSR is not a new concept in India. Corporate like the Aditya Birla Group, the Tata Group, and Indian Oil Corporation, to name a few, have been involved in serving the community ever since their inception. Many other organizations have been doing their part for the society through donations and charity events. Today, CSR in India has gone beyond merely charity and donations, and is approached in a more organized fashion. 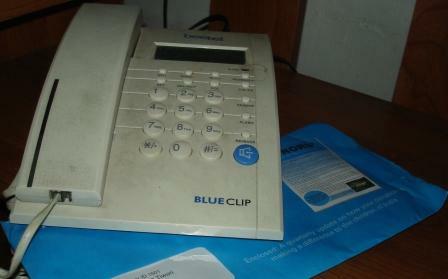 It has become an integral part of the corporate strategy. Companies have CSR teams that devise specific policies, strategies and goals for their CSR programs and set aside budgets to support them. These programs, in many cases, are based on a clearly defined social philosophy or are closely aligned with the companies’ business expertise. Employees become the backbone of these initiatives and volunteer their time and contribute their skills, to implement them. CSR Programs could range from overall development of a community to supporting specific causes like education, environment, healthcare etc. For example, organizations like Bharat Petroleum Corporation Limited, Maruti Suzuki India Limited, and Hindustan Unilever Limited, adopt villages where they focus on holistic development. ITC the Indian tobacco giant runs a large livelihood promotion programme for rural populace, which is part of their business model and hence sustainable. They provide better medical and sanitation facilities, build schools and houses, and help the villagers become self-reliant by teaching them vocational and business skills. Many CSR initiatives are executed by corporates in partnership with Non-governmental organizations (NGOs) who are well versed in working with the local communities and are experts in tackling specific social problems. CSR has come a long way in India. From responsive activities to sustainable initiatives, corporates have clearly exhibited their ability to make a significant difference in the society and improve the overall quality of life. 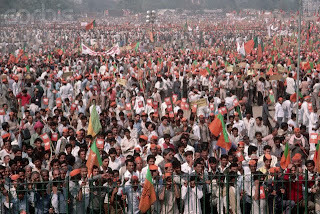 In the current social situation in India, it is difficult for one single entity to bring about change, as the scale is enormous. Corporates have the expertise, strategic thinking, manpower and money to facilitate extensive social change. Effective partnerships between corporates, NGOs and the government will place India’s social development on a faster track. For example, SAP India in partnership with Hope Foundation, an NGO that works for the betterment of the poor and the needy throughout India, has been working on short and long-term rebuilding initiatives for the tsunami victims. Together, they also started The SAP Labs Center of HOPE in Bangalore, a home for street children, where they provide food, clothing, shelter, medical care and education. The sad part or the good part is that India still lacks the structured approach to charity and has a long way to go. Prospective donors are still not aware on how & who to give. There is still a feeling of mistrust where the individuals or corporates are not sure of whether their money is being utilized properly. Though the Indian charities like their counterparts in west and other nations now have more transparent balance sheets to show. The charities share their activities with their donors on a regular basis. This could be one of the reasons why still a number of foundations have been set up by leading Indian firms like Infosys, Wipro, Tatas, TVS, and Dr. Reddy's Laboratory.They have been working on improving healthcare, education, and living conditions, and reduce poverty. These foundations support numerous government primary schools and have developed processes and methodologies for effective change. They support hundreds of non-governmental organizations and have built orphanages, hospitals, and schools. What does this mean for fundraisers in India? If you have a strong cause, the vision and the right tools for asking for help. You will certainly get it as new India is getting more receptive to social giving.We too have our Anand Krishnan’s , Warren Buffet’s , Andrew Forrest’s and Peter Gautschis who believe in giving ( they all hold a spot on Forbes Asia's third-annual list of Heroes of Philanthropy). Many of these not even make the list and keep a low profile. The bit is to find and motivate them enough to join the league of big time social giving.